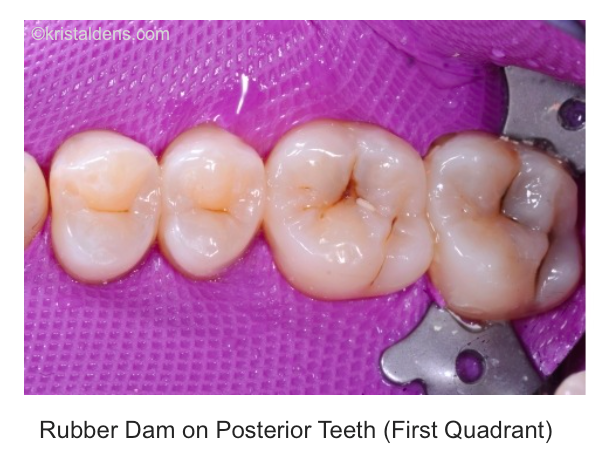 Unlike many of the techniques used in modern restorative dentistry, rubber dam is not a recent innovation. Its use was described by Barnum as early as 1865 in the British Journal of Dental Science. Rubber dam is a thin, rectangular sheet, usually latex rubber, used in dentistry to isolate the operative site (one or more teeth) from the rest of the mouth. Its purpose is both to prevent saliva interfering with the dental work (e.g. contamination of oral micro-organisms during root canal therapy, or to keep filling materials such as composite dry during placement and curing), and to prevent instruments and materials from being inhaled, swallowed or damaging the mouth. 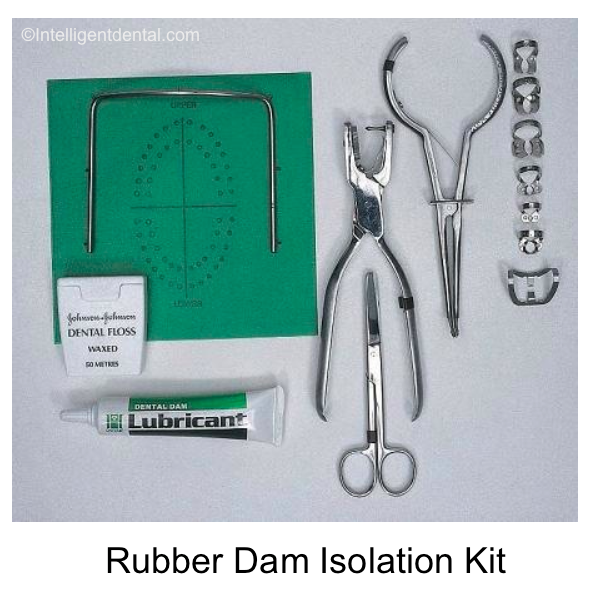 In dentistry, use of a rubber dam is sometimes referred to as ISOLATION. – Clean and moisture-free operating field (saliva, blood). For dental procedures involving bonding with adhesives or cements it is to be encouraged as the operative field must avoid contamination in order to achieve maximum bond strength between restorative material, enamel and dentin. One of the main functions of saliva is to coat the oral tissues to protect them. When a jet of air from a dental hand-piece is used to dry a part of the mouth, this stimulates salivary flow and there is an instinctive reaction to lick the dry area to make it wet with saliva again. This is avoided as the tongue and the output of the salivary glands are on the other side of the dam. – Corrosive endodontic irrigants such as sodium hypochlorite (bleach) are contained, which could damage the soft tissues of the mouth and be harmful if swallowed. – The oral mucosa, lips and perioral skin is protected against injury from instruments and materials. – There is improved visibility of the operative site (retracts the lips and cheeks, more light, less saliva). – Decreased chance of swallowing or inhaling instruments, debris or other items. Should this occur, hospital admission might be necessary for a chest x-ray, and potentially a surgery to remove it. – Use of a dental dam reduces aerosolized contamination (air-borne particulate matter) by 98%. 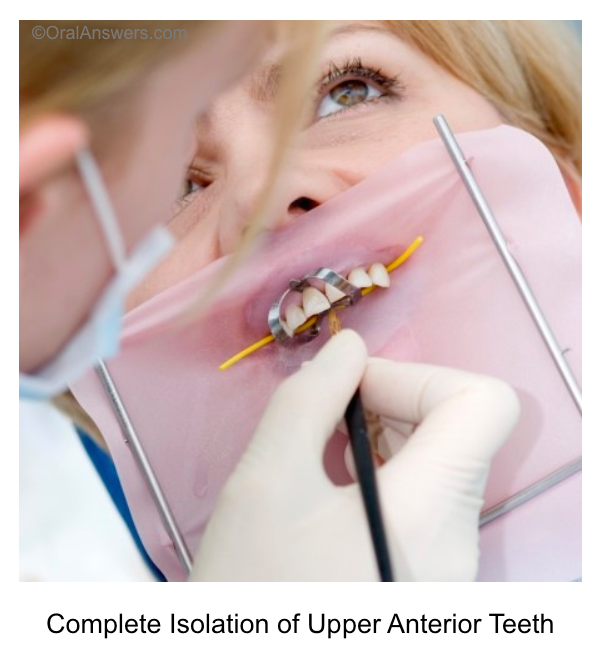 – Some patients find it more comfortable to have treatment with a dental dam since there is no water in the mouth and they more dissociated from the noise of drilling. – Decreased contamination of the pulp system with oral micro-organisms in saliva. – It can shorten the duration of a procedure since the tongue is not constantly in the way which allows the dentist to perform the procedure without distractions. Additionally resulting in a higher quality restoration. – It can help in the administration of nitrous oxide since it forces the patient to primarily breathe through their nose. – Decreases cross contamination, protecting the dentist and dental assistants from any diseases that the patient may have. – Requires extra time for application. – Since it effectively blocks oral airway, the patient must be able to comfortably breath through their nose. Of relevance are temporary causes of nasal airway obstruction such as the common cold, or persons who continually breathe through their mouth for whatever reason. – To an extent, it may lead to visual distortion of tooth morphology since the other teeth and the rest of the mouth are hidden from view. This may lead to perforation if an access cavity is incorrectly angled during root canal therapy. For this reason, some endodontists routinely begin their access cavity before applying the dam, to ensure the correct orientation before the root canal system is opened up. – The dam, which is usually brightly coloured (pink), may alter the apparent color of the tooth, which can lead to incorrect choice of tooth shade during restoration. For this reason, shades are normally chosen before the dam is applied. – Latex allergy, depending upon the severity, may make the use of rubber dam uncomfortable afterwards (allergic contact dermatitis, allergic contact cheilitis, allergic contact stomatitis) or even life-threatening (anaphylaxis). Silicone versions are available for patients with latex allergies. – Some patients find the dental dam claustrophobic. – Reduced communication between patient and dentist may increase patient anxiety and make them feel more vulnerable. – Often they cannot be used in case of extremely malpositioned teeth.